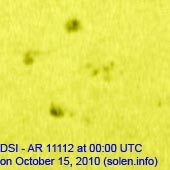 The geomagnetic field was very quiet on October 14. 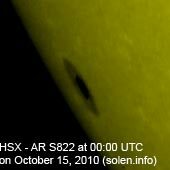 Solar wind speed ranged between 289 and 331 km/s. 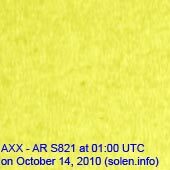 Solar flux measured at 20h UTC on 2.8 GHz was 80.4 (down 1.8 over the last solar rotation). The planetary A index was 2 (STAR Ap - based on the mean of three hour interval ap indices: 1.6). Three hour interval K indices: 10000001 (planetary), 11000000 (Boulder). 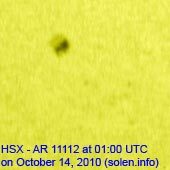 Region 11112 developed fairly quickly as new flux emerged. C flares are possible. Region 11113 was mostly unchanged and displayed little activity of interest. New region 11114 emerged in the southwest quadrant. Minor update added at 05:30 UTC: A sudden increase in solar wind speed was observed just after 03h UTC. This may be the arrival of the CME from October 11, although the associated disturbance so far is unimpressive. October 12-14: No obviously Earth directed CMEs were seen in LASCO or STEREO images. 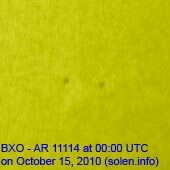 October 11: A possibly Earth directed CME was observed in STEREO images early in the day following a filament eruption (which began late on October 10) stretching northwestwards from region 11112. 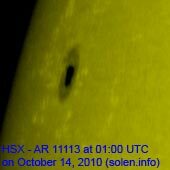 A recurrent coronal hole (CH425) in the northern hemisphere will like rotate into an Earth facig position on October 17. 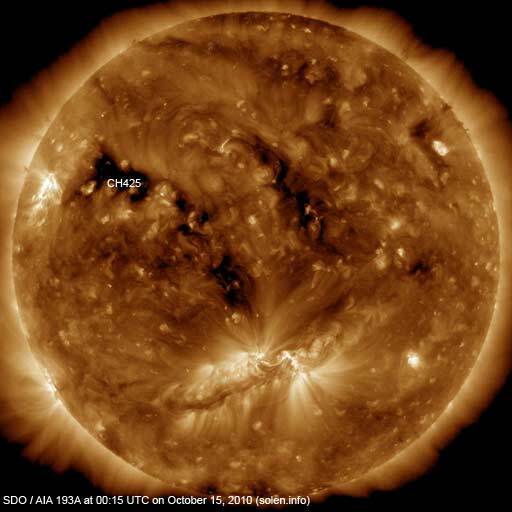 CH425 has decayed significantly over the last solar rotation and it is uncertain if the coronal hole will produce any geomagnetic disturbance this time. 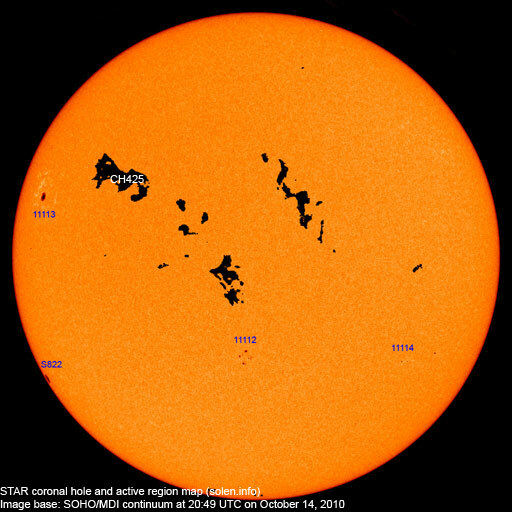 The geomagnetic field is expected to be initially quiet on October 15. 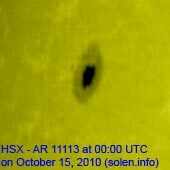 Quiet to active conditions are possible during the latter half of October 15 and on October 16 should the CME observed on October 11 reach Earth. 16. Mostly quiet conditions are likely on October 17-19. Weak effects from CH425 are possible on October 20-21.